Roadwork: This was easily the most disappointing novel in the Bachman Books omnibus. It is a simple story. The city government is planning on building a freeway right through the center of town. A man's home is in the middle of the proposed path. The city has claimed eminent domain and will buy the man's house. The man's job is also in the path of the freeway and his employer has given the man the responsibility of procuring a new site / building for the company. The man has refused to find a new home for him and his wife, and he has refused to close a deal on a new site for his company. He has dithered and dickered and planned and thought about what he is going to do. Instead, the man buys a gun. He delays the building and home purchases and little by little everything slips away from him. His wife, his job, perhaps his sanity. The man will fight back. Thinking about the storyline, it's a good one. It is a premise with promise. King (writing as Richard Bachman) puts the story on a slow build. A bit too slow of a build. Roadwork takes too long to really get going and by the end we're not really sure that the man is even able to do what he wants to do. By the end I'm not really sure I cared. Roadwork was Stephen King's attempt to write a truly mainstream novel. It may be mainstream, but it is not a top shelf effort by Stephen King. It's not even middle shelf. 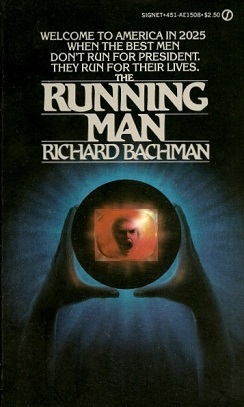 The Running Man: This was the story in The Bachman Books I was most interested in reading. Turns out I knew nothing about the story. In some sort of dystopian future Ben Richards needs to provide for his family. His wife has been turning tricks for money and his 18 month old daughter has a terrible cough and they cannot afford good medicine. Ben turns to these life or death game shows as a way to make sure money. The money is good, but the cost of losing is death. The Running Man is the most popular game show in the country and when he competes he knows he is going to die. The longer he lasts, however, the more money his wife gets. When the show starts and Ben is a hunted man, that’s when The Running Man truly begins. He is hunted by, well, The Hunters. These are the ones who will capture and kill Ben. But every viewer of the show (most people) will turn Ben in if they see him because that way leads to a reward. And besides, people like Ben are the dregs of society. They’re dirty and they're diseased and they will die for entertainment. A little uneven at times, The Running Man is a decent King novel, a science fiction offering, a short novel worth taking the chance to see what else King can write other than straight horror. Roadwork may have been disappointing, but The Running Man is solid. The Dead Zone: As a boy Johnny Smith fell down while ice skating, hit his head, and thereafter was able to get glimpses of the future. The Dead Zone seems to tell three or so different stories. That of Johnny Smith later in life as a school teacher who ends up in a coma after a car accident. If the ice skating accident unlocked Johnny’s gift, the car accident opened the door to the gift. Touching someone or something can sometimes give Johnny glimpses of the person's past or future. The Dead Zone also tells a story about a man named Greg Stillson. Stillson desires great power and though we see evil in his past, nobody knows about it. The third story, more of a side story, is of a sick, twisted killer. Initially unrelated, through Johnny Smith these stories all begin to weave together. The Dead Zone initially seems to have no true focus. It feels like something of a character study of Johnny Smith and Smith not wanting to have or use this gift, this power. But, this being a Stephen King novel (written under his own name, at that), bad things happen. The middle of The Dead Zone drags a bit, but by the end as Smith gets more and more frantic and consumed (which is reminiscent of Roadwork), the novel improves. 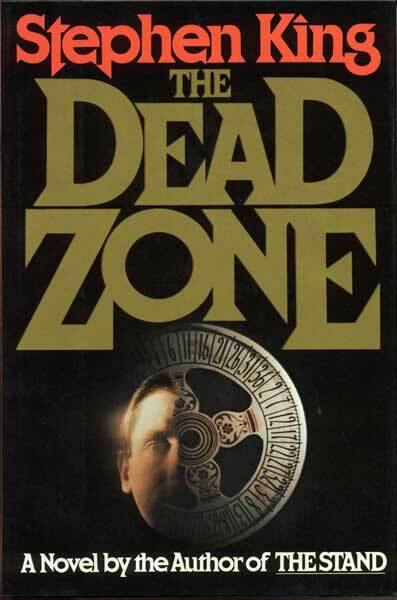 Not that something always has to happen for a Stephen King novel to be good, but The Dead Zone does not have the feeling of the calm before the storm. Half of the book is just the calm. It’s a decent novel, and I can see how / why it was adapted for television, but it is not an outstanding novel. I've always liked the film. Quite disturbing, with a rare lead role by Christopher Walken. Of the Dead Zone, that is. Haven't seen it. All I know is that the television series is on right after The 4400 (that much disappointing show.